Dust off that sax and play with one of our bands! The ensemble program at Music Maker Studios started within weeks of opening in 1979. Many of Bob’s private students had progressed to the point where they needed an outlet to play. Sadly, this situation didn’t exist, at least not to his standards. With the help of some of the finest teachers around Boston, he was able to start 2 ensemble classes focusing on mainstream Jazz. Fortunately, we had functional instrumentation including a full rhythm section as well as trumpet, saxophone, and trombone. They also started building a library of full arrangements of songs that came from stock arrangements as well as students and teachers. Today, the 3 horn book has 130 charts, and also includes 40 arrangements for 4 horns. Ensembles at Music Maker Studios can be as small as a quartet or as large as a 7 piece band. There are some very high level amateur players in these groups. Many have been here for 15 years or more, and for most ensemble members, it’s become a valued part of their weekly routine. 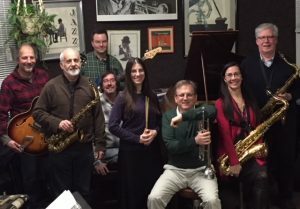 Rehearsals never get cancelled due to lack of attendance, as the ensemble leader, Bob Brenner, is able to fill in on most of the other instruments. Over the years, Bob has become proficient enough on multiple instruments to record a couple of tunes with him playing everything – drums, sax, piano, and bass – which can be heard on his teacher bio page. One of the most positive offshoots of this program is the Corey Hill Saxophone Quartet started in 2001. They just released their first album featuring mostly well known classical pieces as well as a few jazz and swing tunes. In addition to the regular recitals, they’ve made many public appearances and look forward to booking more. Want to play in one of the ensembles? If you think you’d like to participate in one of the ensembles, get in touch with us and we’ll have you sit in with one of the groups to determine a logical placement.